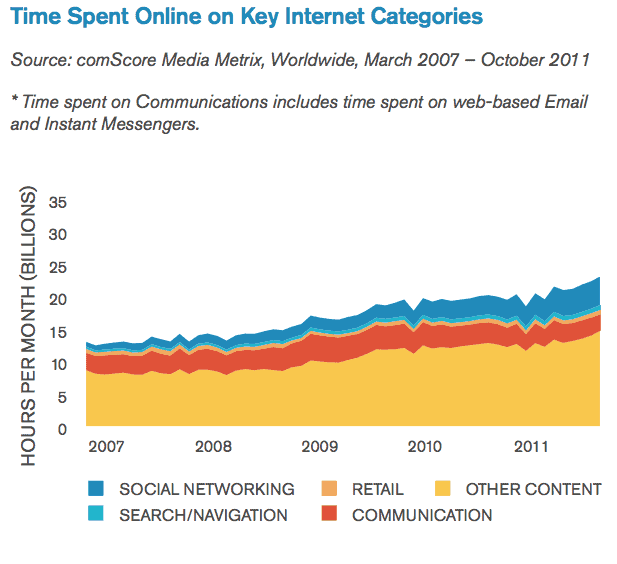 1 in every 5 minutes of time online is now being spent on social networking sites, up from a mere 6% in early 2007. The sites, led by Facebook, now reach 82% of the world’s internet-using population — about 1.2 billion people in total. This growth is happening across countries, with 41 of the 43 countries that the web measurement firm tracks showing penetration of 85% or more. Read the full post: ComScore’s 2011 Social Report: Facebook Leading, Microblogging Growing, World Connecting | TechCrunch.